Welcome to Water's edge, a 4-bedroom luxury villa that is perched on the coast in Nassau, The Bahamas. This Luxury Ocean Front Villa is based along the prestigious Eastern Road in Nassau and expands over 2600 sq. ft of interior and exterior living spaces. This quiet location allows you to have a secluded and private holiday with nothing but the sounds of the ocean nearby. The property overlooks the ocean as well as the panoramic views of Athol and Rose Island. The villa can accommodate up to eight guests and includes features such as a freshwater plunge pool, covered wet bar and built in brick charcoal grill, an outdoor shower and even its own tropical fruit such as sea-grapes and figs growing on the trees. This sun-kissed haven is the perfect place to experience your dream vacation. You can also enjoy the turquoise ocean right from your backyard. 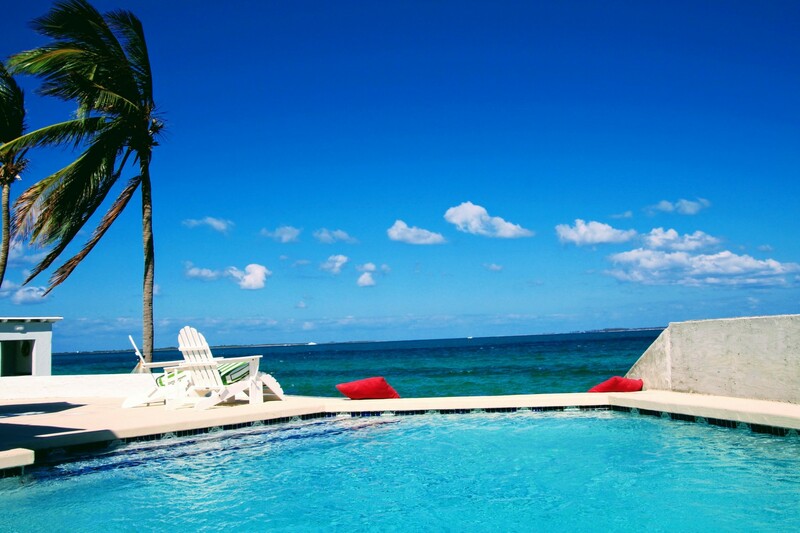 The property rests overlooking the Caribbean Ocean and is set amidst a lush tropical landscape. As the villa is based in a private location it is the perfect place to spend a day relaxing on the Patio. Slip into the fresh water plunge pool for a refreshing swim or lounge on the sun beds to warm up under the suns radiance. Open the back gate and step down into the ocean for a swim or row our dinghy out a few hundred feet to get to the colorful reefs. You can explore the warm shallow water in total seclusion from the outside world as the villa supplies you with snorkeling equipment. The landscaped gardens create an ambiance of luxury and elegance. Relax on the comfortable sun loungers or on the peaceful swaying hammock. You can enjoy a lovely light meal on the patio or simply relax here and enjoy the boats sailing swiftly and silently across the glistening blue waters. The villas exterior living spaces offer you an authentic Caribbean experience. With the perfect backdrop, relaxing by the sea couldn’t be easier. In the evenings you can indulge in some alfresco dining as you spark up the barbeque. Listen to the sounds of the water lapping in front of you and let the Caribbean breeze skim across your skin as you tuck into a delicious meal. Take advantage of the laid-back island lifestyle with an ice-cold drink, from the wet bar, while enjoying the captivating sunsets over this majestic land. Making your way into the villa from the patio you will find the main living area. There is a large comfortable lounging area fitted with deep upholstered couches and chairs. It is the perfect place to relax and talk with your loved ones. It also has an extensive game collection including Monopoly, Game of Life, Scrabble, Poker, Uno, and Cards. The living area has a large high-resolution television and DVD Player so if you want to stay in and watch a film in the evenings you can browse through the DVDs and Blueray discs which also includes most Disney Classics, perfect for young children. The living area will lead you to the indoor dining area. This area includes a Breakfast bar with stools and a large formal dining table with seating for six of your guests. The kitchen comes fully equipped with stainless steel appliances and is ready for you to try out some new recipes. It is fitted with a large refrigerator with an ice machine, a full kit of utensils for outdoor grilling, coolers and cool bags for beach trips, a Coffeemaker, toaster, microwave, electric kettle and Margaritaville automatic margarita maker. There are also additional features for children including a High chair with waterproof floor mats and a Pack n play. Water’s edge has a luxurious Sun Room and loft to offer. The sunroom has a high-top table with seating for five people and a comfortable reading area with seating and ocean-views from the windows. The Loft is where you will discover an expansive reading library with a diverse collection of fiction, non-fiction literature as well as contemporary books. The villa also supplies you with a secure Wi-Fi signal and has a local telephone for you to use. Waters Edge has a total of four luxurious bedrooms, one master bedroom, and three guest rooms. The master room is fitted with a large king-sized bed and has its own private en-suite bathroom. The bathroom includes exquisite features such as a large soaking bathtub with ocean views, a double vanity with storage space and a Walk-In glass shower with ocean views. The bedroom has its own walk-in closet and lounging area. It is fitted with a ceiling fan and individually controlled AC Unit. The three remaining guest bedroom each have Queen-sized beds, closet space, Venetian blinds and individually controlled Air-conditioning units. There is an additional bedroom in the loft if desired with a queen-sized bed and a comfortable desk area. Perched on the coast in Nassau, Water's Edge is situated on the quiet residential Eastern end of the Bahamas. It is embedded near other private luxury properties and secluded from the major tourist hubs, making the area very peaceful. The property overlooks the ocean as well as the panoramic views of Athol and Rose Island. The Lynden Pindling International Airport is a short 30 minute drive from the villa. Water’s Edge is a short 10-minute drive to downtown Nassau where you will discover a profusion of local restaurants. It is also a 10-minute drive from Paradise Island and Atlantis. There are also 2 beaches within swimming and walking distance from the house. The world-famous Cabbage Beach on Paradise Island is a 5-10-minute drive away. There is a local grocery store within a 15-minute walking distance also. Bedroom 1 Master Suite Luxurious King-sized Bed, Private En-suite Bathroom, Large soaking tub with ocean views, Double vanity with storage space, Walk-In glass shower with ocean views, Large walk-in closet, Seating area, Ceiling fan and individually controlled AC Unit, Incredible Ocean Views. Bedroom 2 Large Queen-sized Bed, Luxurious high-quality linens, Expansive closet space, Venetian blinds, Individually controlled Air-conditioning units. Bedroom 3 Large Queen-sized Bed, Luxurious high-quality linens, Expansive closet space, Venetian blinds, Individually controlled Air-conditioning units. Bedroom 4 Large Queen-sized Bed, Luxurious high-quality linens, Expansive closet space, Venetian blinds, Individually controlled Air-conditioning units, Comfortable desk. Water's Edge is situated on the quiet, residential eastern end of the island amongst many other private luxury properties and away from the major (noisy) tourist hubs. You will find many locals out for their morning walk in our area as it is a gorgeous view around the end of the island. It is a short 5 minute drive to downtown Nassau, local restaurants and Paradise Island and Atlantis. The ocean is just a walk down the back steps and you will find many reefs within rowing distance (with our dinghy) and beautiful snorkeling. There are also 2 beaches within swimming and walking distance from the house. The world famous Cabbage Beach (Paradise Island) is a 5-10 minute drive away. There is a local grocery store within walking distance as well.